Sustainability and corporate responsibility are huge, the buzz words of the last decade or so. Since the beginning of the year we have been working with The Proper Welsh Milk Company developing the ‘Proper Welsh’ brand, which has launched in direct response to the issue of localness. 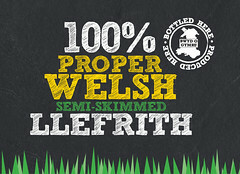 Proper Welsh provides an option to people who want to know where their food is coming from; with locally produced and packaged milk in Wales. It has initially been launched in North Wales and is already been stocked in Tesco with other supermarkets hoped to be coming on board in the next few months.